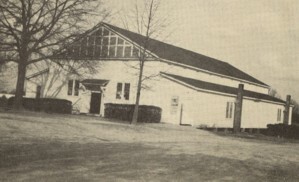 Bogart Gymnasium -"Old Faithful" 1949. This landmark burned around 1985 and the Bogart Community Center is now on the site. Many tense ballgames were played in this old gym and political and other functions. I remember many trips to watch Bogart and Watkinsville teams play each other. The rivalry was fierce and led to family feuds. Much of that dissapated with the consolidation of the two schools in 1956. Lester Maddox spoke from the stage in a campaign address in the summer of 1972.